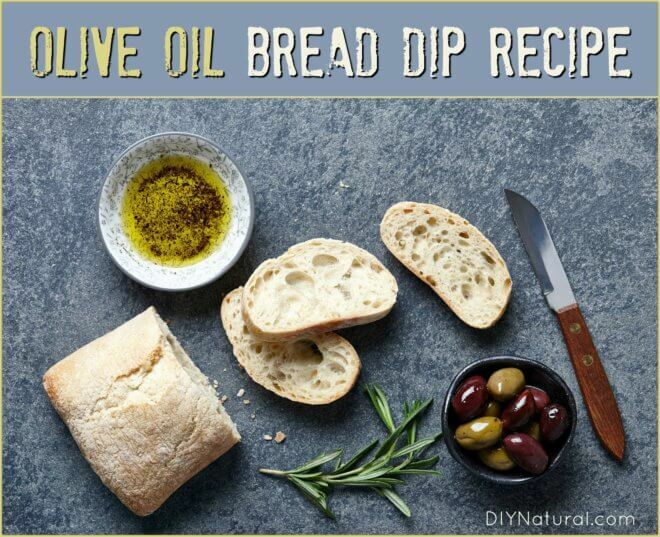 Olive Oil Bread Dip: An Easy-to-Make Bread Dipping Sauce Recipe! Sometimes when I have a few extra dollars, I’ll treat myself and go out to eat. I love Italian food, and the olive oil bread dip is my favorite. It’s also really easy to make! A good bread dipping sauce consists of two parts – the oil and the herbs. In addition to finding a great oil, you’ll need to procure some good herbs. Typical herbs are rosemary, basil, oregano, garlic, and similar herbs. Using fresh herbs gives you the freshest taste, but you can substitute dried herbs in a pinch. Here’s a basic recipe. As always, feel free to make any changes to suit your taste. Instead of chopping herbs separately, chop them all together on a cutting board. Chopping them together will help to mingle the flavors together. When everything is very fine, add the pepper flakes, salt, and black pepper, mixing well. To use right away, place on a saucer and pour the lemon juice and wine over the top, stirring well. Lastly, top with olive oil and serve with a really good Italian bread. Note: If you’re going to keep it for a while before serving, cover and keep in the refrigerator. Add the lemon juice and wine just before serving with olive oil. Just about any herbs can be used for this recipe. Many people also like to add thyme, which adds a different flavor. I’ve tried mine with several different types of basil including Dark Opal Basil, African Blue Basil, Holy Basil, Thai Basil, and Pesto Basil (which is variegated with cream and green leaves). Each one has a slightly different flavor. My favorite is still the plain sweet basil, which is also the most common. Have you made a dipping sauce for bread? Let us know what your favorite herbs are! I make a dip for bread every time I eat bread. I am Italian, we are from the Mediterranean coast, so I use a lot of different oils in my food. Oddly tho, I cannot eat EVOO, or anything made with it, I think it taste terrible. Lol. Anyway I start with a plate, or dish whichever, and first I add the oils. Usually I use mostly Olive Oil, and mix it with 50/50 grapeseed oil and jojoba oil. Then I add the balsamic vinegar, I love it. You can choose to add a little or a lot. Then in my hand grinder, I grind italian herbs ( you can by thevspice premade) over the oil and vinegar. If your on a healthy kick, consider punching garlic and drop it in there, otherwise I add red pepper and a lot of parmesan cheese on it, and viola, EAT!. This is my favorite snack. How long will this keep and where would I store it? On the shelf or refrigerator?